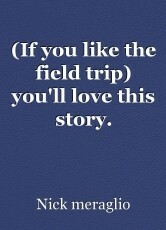 (If you like the field trip) you'll love this story. If you liked my original "field trip" story then oh will also love this read! I was on a school trip with Tina my girlfriend we were both seniors and we were both graduating within two months so of course we felt like we were on top of the world. The ride took three hours, we arrived at a hotel near the ix indoor amusement park. We had three chaperones who we just needed to report to daily to let them know what we were going to do. There was about thirty of us total on the field trip and four slept in the same rooms so we didn't need to much space. Anyways me and Tina were planning to go hang out on the lazy river for a few hours and then go down waterslides. After a few hours we returned to our rooms matt and sarah were already unpacked and we talked with them for a few minutes they were good friends. We convinced them To join us outside at night across the street was a playground we would sit down near the swings and just talk. So that night it was around 10 pm. We arrived at the park and talked about what we wanted to do with life outside school, time got the better of us and before we knew it it was after midnight so we decided to turn in for the night. We returned to our bedroom and closed the door. I had a funny feeling around 3 am. My bed was close to a window, I didn't want to pull up the curtains but a pet of me did. I pulled them up and instantly regretted it as tommy horror a man was outside the window just staring at me. I screamed and woke everyone up they turned to face me and saw the man. Sarah got nervous and wanted to go for help but we stopped her. The next day we went about our day not talking about what had happened. Then night came and we decided to stay inside. We fell aslee with the tv on. It was about four in the morning I woke up to a loud noise. I looked around and saw the man he was on the ground. I screamed. Tina, Sara and matt woke up and saw the man and yelled. The man then said to all of us "you left the tv on, I was just turning it off for you." The man left we locked the door and stayed up the whole night. The next morning we went to see the managers, we gave them a description of the man and they said they had no idea who the guy was, but they would keep an eye out. They have us a free breakfast for the trouble. The waiter however was the same man. We jumped and ran to the manager and told him that the waiter was the same person who was in our bedroom. The managers didn't however believe us and we told the cheperones, who talked to the managers. When we mentioned again that the guy was in our bedroom the staff got upset and told us we had to leave. Although we had to cut our field trip a day short I was glad to be going home. We all entered the bus ignoring the driver, most were either texting or listening to music I wish however we had seen the driver. The drive took way longer than I remembered I looked up at one point and froze in my seat..the man who was in our bedroom, was now driving the bus. he was looking straight at me from the overview mirror inside the bus.